Sham with leaf scroll pattern. Egyptian-cotton matelasse. 2" flange. 21" x 36". Machine wash. Made in Portugal. 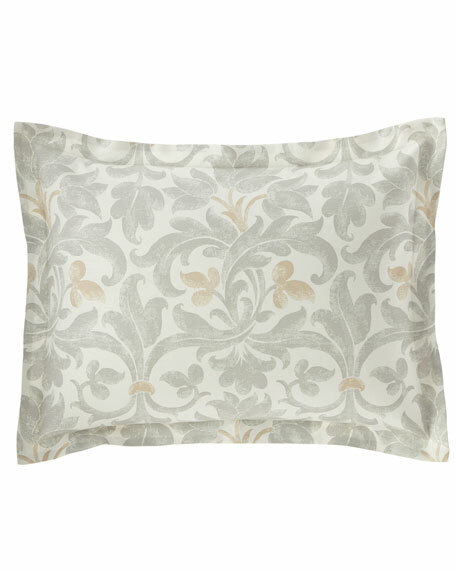 EXCLUSIVELY AT NEIMAN MARCUS Sham with flange and cording detail. Polyester/rayon. Zipper closure. 20" x 36". Dry clean. Made in the USA of imported materials. Sham features a colorful floral print against a cool gray background. 300-thread-count cotton sateen. 20" x 36". Machine wash. Made in Spain.